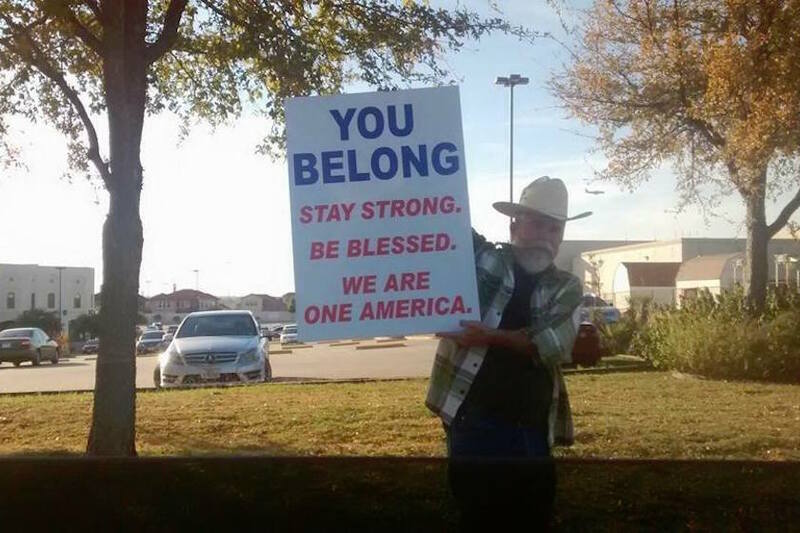 For some people, wearing a cowboy hat says something about who you are and what you care about. But for one Texan, his hat wasn’t a big enough statement. So Justin Normand of Dallas made a sign to share with his neighbors. Let’s be honest. Part of what makes Justin’s story so captivating is that, to many of us, Justin does not look like the kind of person we’d expect to see holding a sign like this. There’s a certain stereotype that assumes a person like this would be more likely to wave a sign saying, “My America. Nobody else allowed.” Like so many stereotypes we carry—often without even realizing it—this one shields us from seeing the truth. They cause us to look at someone without really seeing them. He brought a sign of friendship to those who were feeling fear. He chose to build something good instead of ignoring the bad. He was done feeling helpless over the ways his neighbors were being stereotyped and harassed. He wanted his neighbors to feel friendship instead of fear. His presence—and his sign—brought something beautiful to people in his community that Friday afternoon last November. Breaking up with silence is how we break down hate. Speaking over the loudness of hate and intimidation requires something different. It requires more Justin Normands, more of us refusing to be bystander. Showing up is how we become bridge-builders instead of bystanders; Peacemakers instead of peace-avoiders. Because being a Bystander always says more about us than it is says about them. “This was about binding up the wounded. About showing compassion and empathy for the hurting and fearful among us. Or, in some Christian traditions, this was about washing my brother’s feet. Showing up makes all the difference. Not only does it interrupt the story of hate; it disrupts our stereotypes—sometimes even the ones we didn’t know we had. It interrupts the despair that can fill our hearts. When bystanders become rebuilders, as Justin found out, something else amazing happens. We realize that we need each other. The missing piece of our neighbor’s peace, it turns out, is us. “I can assure you, from their outpouring of smiles, hugs, tears, hospitality, messages extending God’s love, and a bouquet of flowers, it will mean a lot. It worked. I felt better for the impact it had on my neighbors,” Justin says. Love showed up that day as a simple sign, held by an unlikely peacemaker.